In this county with a north and south coastline it can be difficult to choose between beaches, there are just so many. The north Devon beaches tend to be windier, good for surfing and flying kites. Some, especially the shingle beaches are quieter and perfect for sunbathing, fishing, a picnic by the sea or a stroll (wearing shoes). Beer - sand and pebble beach where fishing boats are laid out in rows. Cliff walks. Bigbury-on-Sea - a safe and wide sandy beach in the South Hams which features a special tractor for returning to the mainland from Burgh Island when the tide is in covering the sand spit. Cliff walks. Branscombe - pebble beach in the care of the National Trust. There is a car park and cafe. The road down to the beach winds its way through the village of Branscombe with pretty thatched houses, a National Trust former Blacksmiths. Brixham - very popular seaside resort with a fishing harbour and Breakwater single and sand beach sheltered by a breakwater. Lively town with lots of shops and eateries. Budleigh Salterton - a quiet pebble beach where pleasure craft dot the beach. High reddish sandstone cliffs at the far end of the beach. Dawlish Warren beach - clean safe sandy beach backed by dunes. Family entertainment, lawned area with flower beds. Carnival in the middle of August. Dartmouth Blackpool Sands Beach - award winning popular sandy beach. Dogs are banned. The sub tropical gardens are open from April until October. Plymouth - sandy beach at Plymouth Sound. Historic naval dockyards to visit. Salcombe, South Sands beach by the estuary. Large marina, lots of yachts bobbing up and down. Charming scenery, good facilities. No dogs. Sandy Bay, Exmouth - backed by high cliffs. There is an enormous caravan park sited here. A cliff walk goes from from Exmouth (Orcombe Point) to Budleigh Salterton with great views en-route. Sidmouth - a long beach, shingle at one end then sandy with rocks pools towards Jacob's Ladder where there are attractive gardens, public toilets and a restaurant. Teignmouth - a long stretch of sand and shingle beach backed by a promenade. 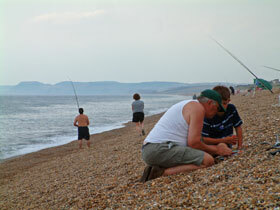 There is also a pier, a thriving harbour and traditional seaside entertainment. Dogs are banned during high season. Torbay - includes the seaside resorts of Torquay, Paignton and Brixham. Torquay - known for its palm trees and mild climate, part of the English Riviera. A string of sandy and sand and shingle beaches stretches along the coast. Dog-friendly beaches include: Maidencombe beach, Watcombe beach, Babbacombe beach.